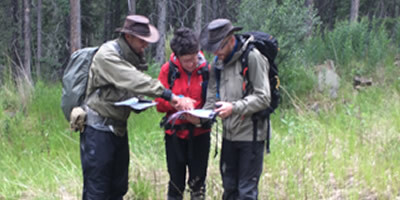 Wilderness Navigation is an important part of any Wilderness Travel Safety Programme. It is a fundamental skill for any wilderness traveller. Do Not Rely Just on 1 Navigation Tool. Your "Navigators Toolbelt" Should Include; Topographical Maps, Air Photos, Quality Sighting Compass, GPS Receiver, Pace Beads, Altimeter, Watch, & Training in Wilderness Navigation. Romers are increasingly hard to find. For this reason BWI is making available to our students and the general public our 1;50,000 Scale Romer for download. Please note this is for personal use only and no copies can be made for distribution or resale. It is easiest to print this on an overhead transparency on a laser or ink jet printer. BWI has made available for download two versions of our Routecards for personal use only. Permission is granted for personal use only, no copies can be made for distribution or resale. These links are for finding and or downloading Canadian NTS Topographical Maps. Lack of a good quality plotter will mean that your maps will need to be printed in small sections and may be of poor quality compared to a regular map dealer. The Ibycus maps are the digitized versions of the regular NTS Maps for use with Garmin GPS and are of excellent quality. They have trees but no routing. Which is not bad since their price is free to download or $25 for a DVD. This is a small list of Canadian Topographical Map Dealers. They can print quality Topographical Maps on order or in person. Certified Map Printers Guarantee Reliable Reproduction of Colours and Scale when they Print Maps. 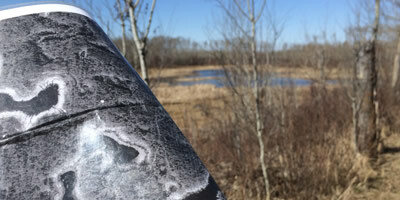 Learning to use the numerous and varied tools of a well trained wilderness navigator is important to gaining the skills necessary to master wilderness navigation. Take the time to get trained in wilderness navigation it will save you time as you travel and may save your life. Any navigation course you take should integrate the use of a GPS Receiver with Topographical Maps and Sighting Compasses. Orienteering is an excellent way of acquiring compass training. The only problem is that modern Orienteering is a sport that now uses special maps and therefore do not use standard topographical maps or air photos you will encounter in the wilderness. Use of GPS Receivers is also not allowed at meets. That aside Orienteering is fun, keeps you active, and challenges you to read a map and use a compass quickly.